Does it really matter what these affectionate people do — so long as they don’t do it in the streets and frighten the horses! 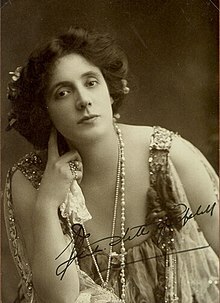 Beatrice Stella Tanner Campbell (9 February 1865 – 10 April 1940) was a British actress, the first actress to play "Eliza Doolittle", in George Bernard Shaw's Pygmalion (which was the inspiration for the musical My Fair Lady). 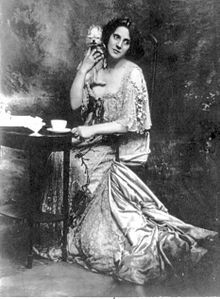 Born Beatrice Stella Tanner she was most commonly known as Mrs. Patrick Campbell or "Mrs. Pat" in reference to her first husband, who died in the Boer War. Oh dear me — it's too late to do anything but accept you and love you — but when you were quite a little boy, somebody ought to have said "hush" just once! Reply to a young actress who asserted that an older actor in a production showed too much affection for the leading man (c. 1910); as reported by Alan Dent in Mrs. Patrick Campbell, p. 78 (1961). Variants: "My dear, I don't care what they do, so long as they don't do it in the street and frighten the horses." "I don’t mind where people make love, so long as they don't do it in the street and frighten the horses." "It doesn't make any difference what you do in the bedroom as long as you don't do it in the street and frighten the horses." "Does it really matter what these affectionate people do, so long as they don't do it on the street and frighten the horses?" On the internet, a similar comment regarding politicians has been widely attributed to Victor Hugo, but without any definite sources. It appears to be a modern satirical invention, derived from Mrs. Campbell's statements. Letter to George Bernard Shaw (1 November 1912) published in Bernard Shaw and Mrs. Patrick Campbell (1952), p. 52; this was later used in the play Dear Liar : A Biography in Two Acts (1960) by Jerome Kilty, an adaptation of the correspondence between Shaw and Campbell. The deep, deep peace of the double-bed after the hurly-burly of the chaise-longue. She has such pretty little eyes — And they're so close together! No definite source has been found for this statement; though most often attributed to Sir Winston Churchill, and sometimes to Abraham Lincoln, it has only rarely been attributed to Campbell. I want my dark lady. I want my angel. 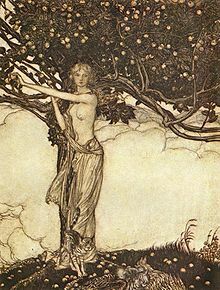 I want my tempter, I want my Freia with her apples. I want the lighter of my seven lamps of beauty, honour, laughter, music, love, life and immortality. I want my inspiration, my folly, my happiness, my divinity, my madness, my selfishness, my final sanity and sanctification, my transfiguration, my purification, my light across the sea, my palm across the desert, my garden of lovely flowers, my million nameless joys, my day's wage, my night's dream, my darling and my star. Photograph (among 3 others of Early 20th Century actresses). This page was last edited on 20 December 2018, at 02:39.